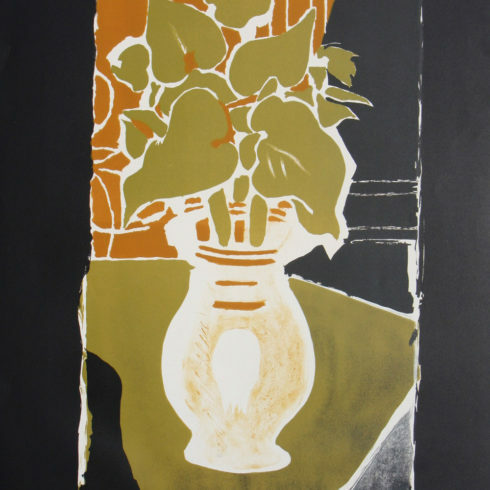 Our Fine Art Gallery has the finest quality Georges Braque original prints, lithographs, etchings, aquatints, collotype and posters. We have a large inventory available off-site and we encourage you to make an appointment to see specific works you are looking to collect. We are happy to meet you at either our art gallery showroom or at your home or office for a private presentation. Artist Georges Braque was born on May 13, 1882, in Argenteuil sur Seine, France. The son of a house decorator, Georges Braque received his first art lessons in painting from his father. In 1890 the Braque family moved to Le Havre, where Georges Braque would attend evening art classes at the Ecole des Beaux-Arts from about 1897 to 1899. At the age of 19, Georges Braque left for Paris to get a craftsman certificate. From 1902 to 1904, Georges Braque studied art at the Academie Humbert in Paris, where Braque met artists Marie Laurencin and Francis Picabia. By 1906, Georges Braque had evolved his art from the Impressionist style into the bolder Fauvist style. Georges Braque showed Fauvist works of art the following year in the Salon des Independants in Paris. Georges Braque had his first solo art show at Daniel-Henri Kahnweiler’s gallery in 1908. In 1909, Georges Braque began to work very closely with artist and collegue Pablo Picasso, as the two artists’ styles were becoming very similar. Both Braque and Picasso’s art showed an increased interest in geometry and simultaneous perspective, and by 1911 Georges Braque and Pablo Picasso had developed the artistic style of Cubism. One of Picasso’s many pet names for Georges Braque was ‘Vilbour’ or ‘Wilbourg’, a reference to Wilbur Wright. Pablo Picasso saw in their 1908-1914 creative art partnership something that was akin to the brothers Wilbur and Orville Wright, the pioneers of sustained powered flight. In 1912, Georges Braque and Pablo Picasso started to incorporate collage elements into their art and to experiment with the papier colle (pasted paper) technique, in which Barque utilized a roll of wallpaper found in a local shop. Braque and Picasso’s productive collaboration continued until the outbreak of World War I in 1914. Georges Braque served with honor in the French army during World War I and was seriously wounded in the head, leaving Braque temporarily blinded and unable to create art. Upon recovering in 1917, Georges Braque began a close friendship with cubist artist Juan Gris. After the war Georges Braque became freer and less schematic in his art, moving away from the harsher abstraction of Cubism. Braque painted many still life subjects during this time, maintaining an emphasis on structure. In 1922 Georges Braque had an art exhibition at the Salon d’Automne in Paris that brought Braque great fame and recognition. During the mid-1920s, Georges Braque designed the art decor for two Sergei Diaghilev ballets. By the end of the decade, Georges Braque had returned to a more realistic interpretation of nature, although certain aspects of Cubism always remained present in Braque’s art. In 1931, Georges Braque created his first engraved plasters and began to portray mythological subjects. Georges Braque had his first important art retrospective in 1933 at the Kunsthalle Basel. In 1937 Braque won First Prize at the Carnegie International, in Pittsburgh. During World War II, Georges Braque remained in Paris. During this period Braque primarily painted still-lifes and interiors, and Braque’s art became more and more somber as the war continued. 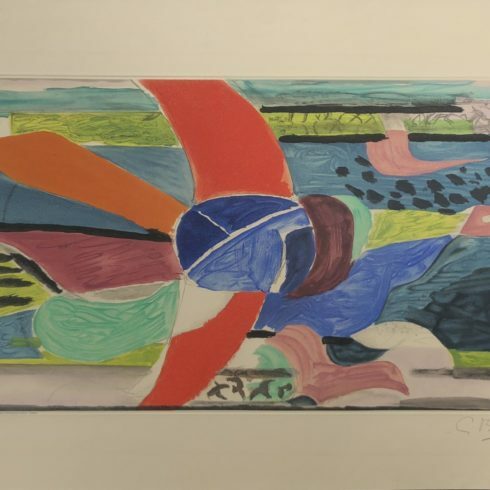 From the late 1940s Georges Braque created numerous lithographs, engravings, and sculptures where, Braque utilized recurring themes of birds, ateliers, landscapes, and seascapes. Georges Braque, along with Henri Matisse, is credited for introducing Pablo Picasso to Fernand Mourlot, and most of the lithographs, illustrated books, and original prints Braque created in the 1940s and ’50s were produced at the Mourlot Lithograph Studios. In 1948 Georges Braque was awarded the main prize for painting at the Venice Biennale, and in 1951 Braque was made a Commander of the Legion of Honour. A few years later, Braque employed his skills as a craftsman, when Braque designed stained-glass windows for the church of Varengeville and painted the ceiling for the Etruscan Gallery at The Louvre. In 1961 George Braque had the distinction of being the first living artist to have his art exhibited at The Louvre. During the last few years of Braque’s life, ill health prevented Braque from undertaking further large-scale commissions, but Baroque continued to paint, create lithographs, and design jewelry. Georges Braque died on August 31, 1963, in Paris with his wife, Marcelle, at his side.